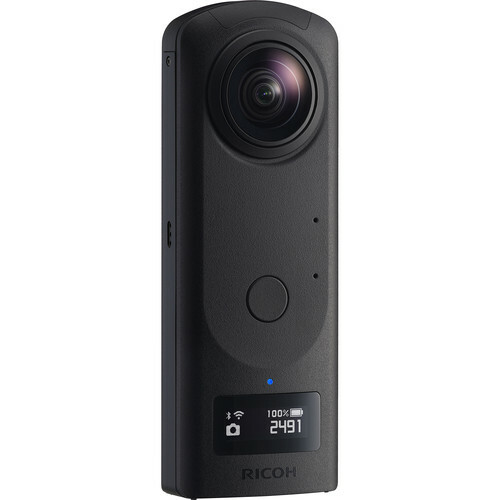 Ricoh's flagship THETA Z1 360° Camera offers high quality 360° imaging in a compact, easy-to-use form. Using dual 1"-type back-illuminated CMOS sensors and a revamped processing algorithm, the THETA Z1 provides highly realistic spherical images with improved noise reduction and low-light performance. The THETA Z1 can record or live stream up to 4K video or capture 23MP raw and/or JPEG photos. The THETA Z1's dual 23MP sensors and twin lenses capture two wide-angle images and automatically stitches them into one complete image. Automatic DR (dynamic range) compensation helps to reduce blown-out highlights and increases details in shadowed areas. Its lens system offers selectable f2.1, 3.5, and 5.6 apertures for increasing your depth-of-field and increasing resolution. The optical system also features reduced ghosting, fringing and flares for more accurate image reproduction. Video capture has been improved with 3-axis image stabilization for smoother shots and built-in microphones capture audio from four independent directions for realistic sound. Take advantage of raw photo editing using Ricoh's THETA Stitcher and your Photoshop Lightroom Classic CC platform. Live stream to social media platforms or the Theta 360 dedicated website, upload still photos to Google Maps or use the Remote Playback plug-in and a separate wireless receiver to display your content on a larger screen. Additional functions like USB data transfer and more are available through the use of optional Ricoh or third-party plug-ins. The THETA Z1 provides 19GB of internal memory and records up to 5 minute clips in 4K and up to 25 minutes in 2K with respective storage totals of 40 minutes and 130 minutes. The robust THETA Z1 is constructed from a magnesium alloy with a textured finish and incorporates a 0.93" OLED status display panel with a function control button. Smartphone control is required to change modes or switch manual settings. How is this better than the previous theta v? There are many improvements, in the Theta Z1. Ricoh has added High Sensitivity-low noise shooting for better detail and higher contrast, and less grain. It is equipped with three prisms, 14 lenses, in 10 groups. It has a slim body, and improved optics. The new three stage aperture mechanism improves overall perceived resolution by automatically changing the aperture, depending on how bright the location is. It has an IR Absorption filter that helps eliminate or reduce red spot ghosting and flare, and purple fringing. These were problems on the previous model. Dynamic range compensation has been improved. This results in more natural color hues. Other than rechargeable, are there any specs to the battery? Can an external battery be added to extend the 1 hr run time? The internal battery is 1850 mAh. You can use any standard portable external USB battery. The unit states &quot;In Japan, indoor use only, except when connecting to 5.2ghz high power&quot;.... really? what does this mean? In Japan, a 5 Ghz low power data communication system, such as a typical Wi-Fi router can only be used outdoors if it is controlled by a 5.2 Ghz High Power data communication System Base station or relay station. This rule is only relevant in Japan. Why does Ricoh insist on only giving these 360 cameras 19GB of non-upgradable storage! 19!?! Ricoh says that limiting internal storage to 16 GB saves cost to the consumer. Also, miroSD cards while typically reliable, are more prone to problems. At 16 Gb, you can expect continued, reliable use. Is it only compatible with Android? No mention of iPhone. The V has Apple app. Can I make HDR photo or video with the Z1? Is the lense stabilized like insta one?